(DLC) First Pilot Deputy Lead Crew Mission. For mission date and targets see Combat Missions. 1Lt George E. Baltes (P) - First mission (204) flown with a combat Orientation CoPilot, 2Lt John W. Reed. Three missions (223, 224, 225) flown as CoPilot with Lead Crew Pilots and crews. All other missions flown as First Pilot. Completed 35 mission combat tour on 17 Oct 1944 (Mission 258). 2Lt Robert A. Marble (CP) - All missions flown as CoPilot. Stood down on 1Lt Baltes missions 223, 224, 225). Flew on one mission (204) with 1Lt William A. Arnold (P). Completed combat tour (33 credited missions) on 17 Oct 1944 (Mission 258). 2Lt Edward H. Macaulay (N) - Did not fly with 1Lt Baltes on 7 missions (223, 224, 225, 240, 247, 249, 258). Flew with other pilots on five credited missions: With 2Lt Paul M. Mowrey (226); With 1Lt Garland M. Whitlock (240, 244, 247, 249). Completed combat tour (33 credited missions) on 5 Oct 1944 (Mission 251). 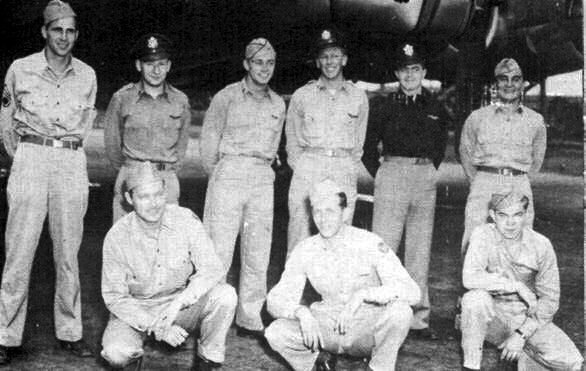 2Lt Fred E. Glover (B) - Did not fly with 1Lt Baltes on 11 missions (223, 224, 225, 235, 237, 238, 240, 247, 249, 250, 258). Flew with 1Lt Garland M. Whitlock (P) on five missions ( 238, 240, 244, 247, 249). Completed combat tour (30 credited missions) on 15 Oct 1944 (Mission 251). T/Sgt John J. Stenger (E), T/Sgt Lloyd Giltenboth (R), S/Sgt Milton C. Kanz (BTG), S/Sgt Austin C. Godsey (WG) and S/Sgt Branislaw B. Posluszny (TG). 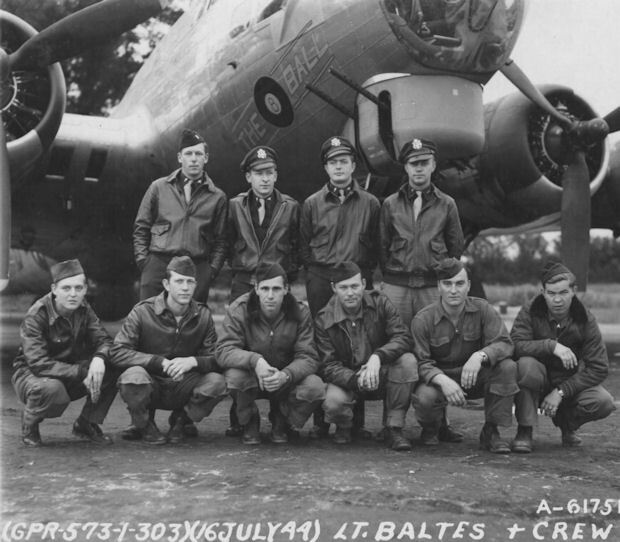 All missions flown with 1Lt Baltes. Combat tours completed on 17 Oct 1944. Stood down on following missions with 1Lt Baltes: T/Sgt Stenger (E) and S/Sgt Godsey (WG) - 33 credited missions (223 & 224 not flown); T/Sgt Giltenboth (R) and S/Sgt Posluszny (TG) 32 credited missions (223, 224 & 225 not flown); S/Sgt Kanz (BTG) 31 credited missions (223, 224, 250 & 251 not flown) - Missions 250 and 251 flown by 1Lt Baltes without a Ball Turret Gunner. Sgt Robert F. Walls (WG) - Was an original crewmen. Deleted from crew before they arrived at Molesworth, when crew size changed from 10 to 9 men. 15 October 1944. 1st Patrick H. Brabant, an experienced 359th BS Pilot, was giving 2Lt Robert A. Marble local transition training in #42-38050 Thunderbird (359BS) BN-U. While practicing a landing CoPilot 2Lt Robert A. Marble hit hard and short of the runway and broke the landing gear drag link. 1Lt Brabant applied full power and took off. They circled the Molesworth airfield for 6 1/2 hours to consume gasoline. 1Lt Brabant made an excellent one-wheel landing. The B-17G swerved off the runway as speed was lost. See the crash photos here.